Encuentra asistencia y herramientas por Internet para tu Jetpack MiFi 8800L. 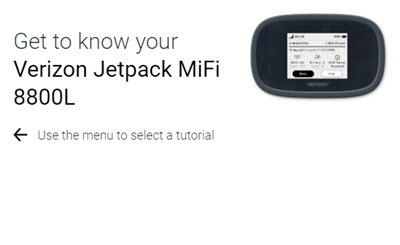 Learn how to set up your Jetpack MiFi 8800L. Here's how to change the password used to access the Admin page for your MiFi 8800L. Here's how to activate your MiFi 8800L. Here's how to navigate to the admin page for your MiFi 8800L. This User Guide can help you get the most out of your mobile hotspot. Learn about set up, feature use and advanced functions. Here's how to turn audio alerts (low battery, etc.) on/off for your MiFi 8800L. Discover how to adjust the screen timeout on your Verizon Jetpack MiFi 8800L. Find out how to change the password on your Verizon Jetpack MiFi 8800L. An interactive map of the Home screen and buttons on your Verizon Jetpack MiFi 8800L. Learn how to reset your Verizon Jetpack MiFi 8800L. A visual guide for updating the software on your Verizon Jetpack MiFi 8800L. An interactive map to view the devices connected to your Verizon Jetpack MiFi 8800L. An interactive map to view data usage from you Verizon Jetpack MiFi 8800L. Here's how to configure display, sleep and power-down options for your MiFi 8800L. Here's how to identify ports and view the charging status of your MiFi 8800L. Here's how to insert the battery into your MiFi 8800L. Here's how to remove the battery from your MiFi 8800L. A visual guide for accessing settings on your Verizon Jetpack MiFi 8800L. Learn how to find more help for your Verizon Jetpack MiFi 8800L. Learn how to add a nano SIM card to your Verizon Jetpack MiFi 8800L. Here's how to view how much data your MiFi 8800L has used. Here's how to view the device ID (IMEI) for your MiFi 8800L. Here's how to view the phone number, SIM status, etc. for your MiFi 8800L. Here's how to view device and network-specific info for your MiFi 8800L. Here's how to find the password/key for your MiFi 8800L. Here's how to view the mobile number your MiFi 8800L is using. Here's how to change advanced settings (e.g., Networks, Manual DNS, etc.) on your MiFi 8800L. Here's how to choose a shutdown time limit for your MiFi 8800L. Here's how to test your MiFi 8800L firewall settings. Here's how to configure advanced LAN settings for your MiFi 8800L. Here's how to change MiFi share settings on your MiFi 8800L. Here's how to block access to services or apps on your MiFi 8800L. Here's how to configure your MiFi 8800L port settings if access is blocked. Here's how to view/change security settings (password) for your MiFi 8800L. Here's how to use an audio alert to locate your MiFi 8800L. Here's how to change GPS over Wi-Fi settings for your MiFi 8800L. Here's how to check Wi-Fi settings if you're having issues connecting to your MiFi 8800L. Here's how to view info about devices connected to your MiFi 8800L. Here's how to reset your MiFi 8800L if it won't connect, crashes/resets, freezes or runs slowly. Here's how to check for software updates for your MiFi 8800L. Here's how to view the software version your MiFi 8800L is running. Here's how to insert a SIM to assist with activation or connectivity issues on your MiFi 8800L. Here's how to change the SIM card lock code on your MiFi 8800L. Here's how to remove a SIM to assist with activation or connectivity issues on your MiFi 8800L. Here's how to lock the SIM card for your MiFi 8800L to prevent use until a PIN is entered. Here's how to unblock the SIM card on your MiFi 8800L. Here's how to view the SIM card number for your MiFi 8800L. Here's how the LED status indicator is used on your MiFi 8800L. Here's how to view the signal strength (signal bars) for your MiFi 8800L. Here's how to delete messages from your MiFi 8800L. Here's how to view text messages sent to your MiFi 8800L. Here's how to add a new Wi-Fi (WPS device) to your MiFi 8800L. Here's how to change the Wi-Fi password used to connect to your MiFi 8800L. Here's how to configure which APNs your MiFi 8800L can use. Here's how to control MAC address access for your MiFi 8800L. Here's how to view network mode settings on your MiFi 8800L. Here's how to disable Wi-Fi connectivity on your MiFi 8800L and use a tethered connection. Here's how to display or not display your MiFi 8800L Wi-Fi name to other devices.